For example, if the Irish Lotto draw is a modest £2.9 million. By adding the Double Jackpot to your stake you'll instantly increase your personal Irish Lotto jackpot to a cool £5.8 million. Bored of waiting around for a Special Jackpot or Rollover Reload? Want to create your very own super-sized jackpot? It's not restricted to one draw either, with Double Jackpot activated you can customise your Betslip in all sorts of ways, giving you more chances to win your very own big jackpot. Want a shot at several Double Jackpots? No problem, just ensure Double Jackpot is checked on your Betslip and then choose how many weeks you want it to run for. We also have the hugely popular Jackpot Hunt feature, which automatically renews your lotto bets until a jackpot has been won. This means, in a rollover situation, you can keep chasing that ever-increasing jackpot until there is a winner. You never know, it could be you! 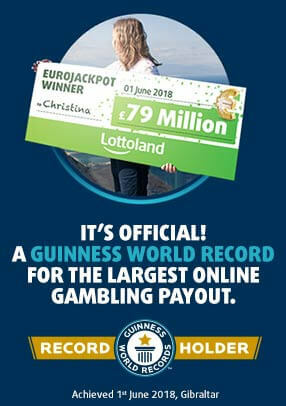 That's not all, Lottoland provides numerous Rollover Reloads and Special Jackpots every year. We boost our jackpots way beyond the levels of the main draw, giving you more chances to win bigger. Plus, for those of you who are serious about dramatically boosting your chances of banking the jackpot, our integrated Syndicates function is available on our most popular lotteries. Click here to find out more. This Christmas our Double Jackpot feature earned a lucky winner over £200,000 more on El Gordo. Jack from the West Midlands walked away with £421k when he banked his share of our El Gordo jackpot. He would have pocketed £210,000, but chose to enable Double Jackpot on his Betslip, doubling his winnings! Bet today and be in with a double sized jackpot!